The moving panorama was exhibited statically due to its fragile condition. Because 16,000 square feet was needed to exhibit it, it was shown at the Kilburn Mill in New Bedford, an early 20th century textile mill. This is the entrance to the exhibit. Photo by Sue Truman. I had a glorious visit to the New Bedford Whaling Museum in August of 2018. 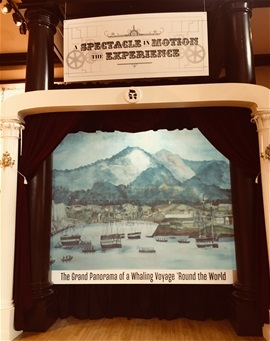 They were exhibiting their Grand Panorama of a Whaling Voyage 'Round the World moving panorama, painted in 1848 by Benjamin Russell and Caleb Purrington. 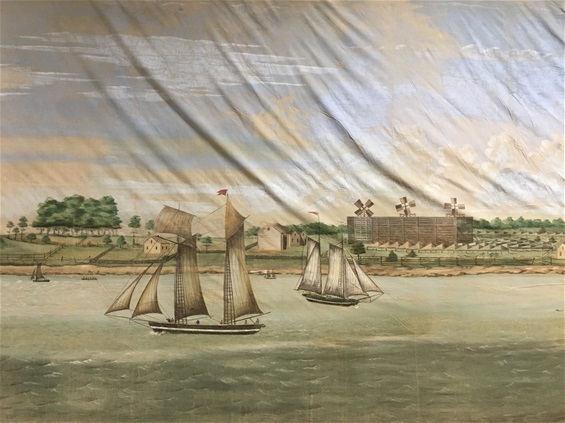 There are only 20 or so of the large, 19th century moving panorama scrolls that have survived. It is rare that any of them are exhibited so this was a huge deal! Exhibiting the huge painting, which was in a fragile state, was an immense undertaking. In total, the process of planning, raising hundreds of thousands of dollars and finally restoring the scroll took nearly 20 years. A Grand Panorama crankie! Available for purchase at the New Bedford Whaling Museum's on-line gift shop, The While Whale. 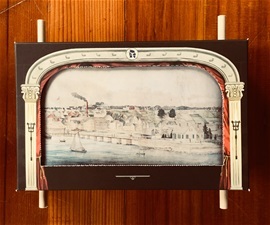 In the spirit of great 19th century moving panorama shows, the museum left no stone unturned in celebrating and commemorating this major achievement. The painting was on display from July 8th to Oct. 8th, 2018. During that time there were lectures, a life-size digital presentation with narration and music, books published, a miniature crankie kit for sale and even a crankie workshop! Below you will see five of the 240 (!) scenes of the painting. Heavy seas and ice bergs off Cape Horn. Photo by Sue Truman. The Port of Horta, Fayal. 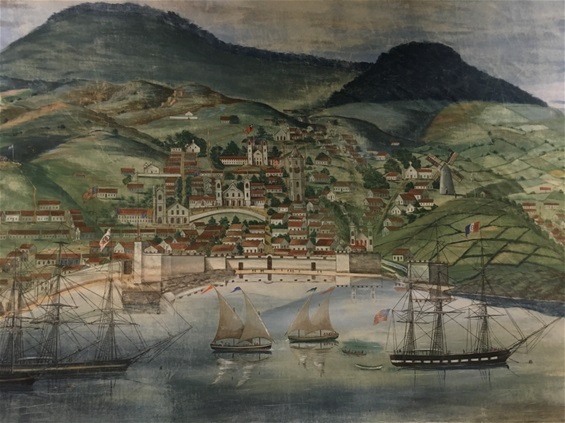 The ship on the right flying the blue, white and red flag is the Marengo of New Bedford . Photo by Sue Truman. In 1847, a volcanic eruption at Fogo Island, Cape Verde. I love that you can see small folds in the cotton scroll. It made it feel more moving panoramic! Photo by Sue Truman. The big building is factory for making salt. The windmills move the pumps which bring in sea water. Photo by Sue Truman. A pretty hotel on Palmer's Island. Photo by Sue Truman. 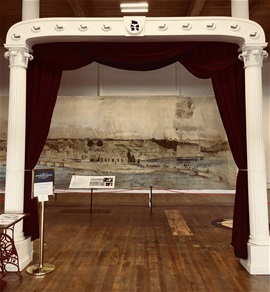 A life size digital copy of the moving panorama was created and is shown at the New Bedford Whaling Museum, complete with music and narration. Photo by Sue Truman. 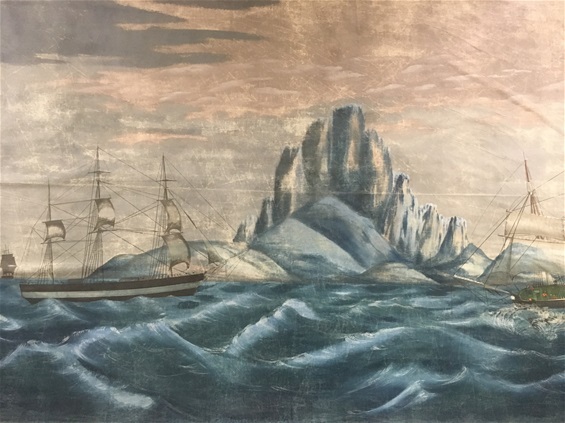 As the painting was being restored, each section was photographed by Michael Lapides, Director of Digital Initiatives at the New Bedford Whaling Museum. The photographs were stitched together to make an Online Digital Version. This is a valuable resource now and for generations to come. In addition to the online version, a life-size, projected version was shown at the museum, complete with narration and music. This will continue to be shown at the museum for the next few years. 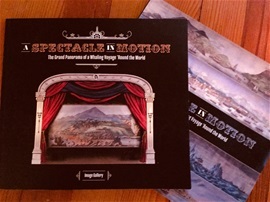 A Spectacle in Motion book set. And that's not all! The museum published a two volume book set. Volume I is a collection of articles written by the museum's staff. It tells about the artists, general moving panorama history; an overview of the content of the moving panorama and the restoration/conservation process. Volume II contains photographs of the moving panorama along with descriptions of each scene. Because the moving panorama is cranked right to left (they are usually cranked left to right) the book reads from back to front! 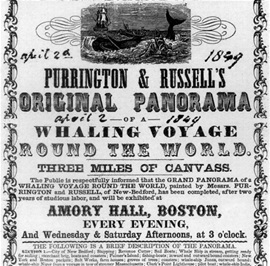 A broadside for a performance in April of 1849 at Armory Hall in Boston. Image from Wikipedia. As a maker/performer of crankies, I am natually interested in how the scroll was made, cranked and performed. Here are a few facts along with my ponderings. The scroll was painted with water-based, distemper paint on cotton sheeting. It measures 1,275' in length and 8.5' in height making it the longest surviving moving panorama from that era. A few sections of the painting were revised/painted over by the artist. Revisions were not uncommon in those days. Once the artist saw the moving panorama being cranked from a distance, he might have thought of things he wanted to change. Or, after performing the panorama, he might have gotten more ideas based on the audience's reactions. Years of wear and tear took a toll on the painting. The paint was flaking off in some sections, leaving some of the original artwork exposed. The museum made the decision to leave it alone so that we could see a bit of the editing process. Thank you! Captain Daniel McKenzie, who had experienced 8 whaling voyages all over the world, was hired to narrate. No doubt, he was able to add fantastic personal stories. There might have been special lighting and sound effects during the storm scene. Use of hand-cranked wind machines, thunder sheets and rain boxes were commonly used in moving panorama shows of that time. Cranking - Most all moving panoramas were cranked from left to right, but this one is unusual in that it was cranked from right to left. The artists cared about accuracy. Cranking right to left followed the route of the ship if one was traveling out of the harbor of New Bedford. The crankist stayed behind the painting during the performance, hidden from view. Sometimes, the artist put symbols or words on the back of the painting to signal the crankist when to stop or start cranking. I did inquire about any marks on the back of the painting and there are none. It made me wonder how the narrator communicated stopping, slowing down or speeding up to the crankist? Sometimes a code of coughs and a stamp of the foot were used (as written about by Mark Twain). Travel was a challenge back in those days. The crew would have used horse and cart, train and maybe steamboat. They would need to keep the immense spools secure and protected from wind and rain. Not an easy task as written about by another moving panorama showman in An Exhibitor's Diary. 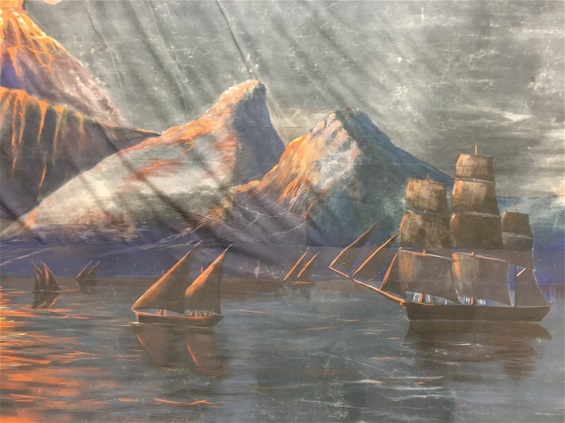 by Michael Dyer, Curator of Maritime History at the New Bedford Whaling Museum. 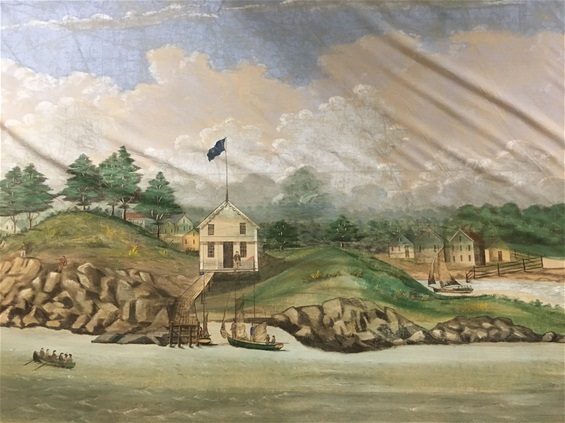 A fascinating look at the history of the painting, the artists and New Bedford in the 19th century. This photo gallery gives you an idea of the size of the painting and the process of installing it at the Kilburn Mill.